A romantic page-turner propelled by the sixty-year secret that has shaped two families, four lovers, and one seaside resort community. 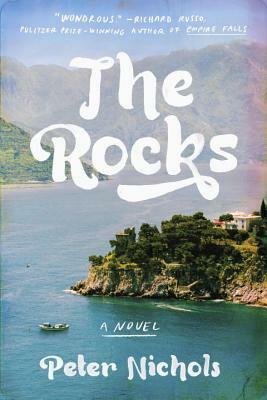 Set against dramatic Mediterranean Sea views and lush olive groves, The Rocks opens with a confrontation and a secret: What was the mysterious, catastrophic event that drove two honeymooners apart so suddenly and absolutely in 1948 that they never spoke again despite living on the same island for sixty more years? And how did their history shape the Romeo and Juliet like romance of their (unrelated) children decades later? Centered around a popular seaside resort club and its community, The Rocks is a double love story that begins with a mystery, then moves backward in time, era by era, to unravel what really happened decades earlier. Peter Nichols writes with a pervading, soulful wisdom and self-knowing humor, and captures perfectly this world of glamorous, complicated, misbehaving types with all their sophisticated flaws and genuine longing. The result is a bittersweet, intelligent, and romantic novel about how powerful the perceived truth can be as a bond, and as a barrier even if it's not really the whole story; and how one misunderstanding can echo irreparably through decades. Peter Nichols has worked in advertising and as a screenwriter, and a shepherd in Wales, and he has sailed alone across the Atlantic. He divides his time between Europe and the United States.